Hailed as a conductor who leads with "passionate intensity" and recognized as "one to watch," Roger Kalia is one of America's most exciting young conductors. A three-time recipient (2018, 2017, 2013) of The Solti Foundation U.S. Career Assistance Award, Kalia was recently appointed Music Director of Orchestra Santa Monica. He is also entering his fourth season as Assistant Conductor of Pacific Symphony and Music Director of Pacific Symphony Youth Orchestra. Kalia also serves as Co-Founder and Music Director of the Lake George Music Festival in upstate New York, which was recently featured in the League of American Orchestra’s Symphony Magazine as one of the premier summer classical music festivals in the country. In addition to his current positions, Kalia is in consistent demand as a guest conductor. Upcoming engagements for the 2018-2019 season include a re-engagement with the Wheeling Symphony and debuts with the Spokane Symphony and Symphony New Hampshire. During the 2017-18 season, he made his European subscription debut with the Szczecin Philharmonic in Poland to rave reviews, led the Camarada Chamber Orchestra of San Diego, returned to conduct the Bakersfield Symphony on their annual Gala concert, and collaborated with the Orange County Music and Dance School in a benefit concert titled “From Classical to Rock” featuring rock stars Johnny Rzeznik (Goo Goo Dolls) and Nancy Wilson (Heart). Additional recent guest conducting engagements include the National Symphony at the Kennedy Center, Chicago Sinfonietta at Symphony Hall, Long Beach Symphony, Great Falls Symphony, Owensboro Symphony, Boise Philharmonic, and Adrian Symphony. Kalia has collaborated with a wide range of artists including Glenn Dicterow, David Kim, Nikki and Timothy Chooi, Randy Newman, Shayna Steele, Lisa Pegher, the B-52s, PROJECT Trio, Jack Black, Fei-Fei Dong, and Misha Dichter. He has also served as cover conductor for the Los Angeles Philharmonic, San Diego Symphony, St. Louis Symphony, Kansas City Symphony and Indianapolis Symphony. Kalia has worked in various capacities with the New York Philharmonic, Pittsburgh Symphony, Seattle Symphony, Utah Symphony, Fort Worth Symphony, Danish National Symphony, Winnipeg Symphony and Royal Scottish National Orchestra. He conducted the Memphis Symphony in 2011 after winning Second Prize in their International Conducting Competition, which led to his debut the following season and launched his professional career. Prior to joining Pacific Symphony, Kalia held conducting positions with the Charlotte Symphony, the Young Musicians Foundation (YMF) Debut Orchestra and the Columbus (IN) Symphony Orchestra. Described as the region's 21st century "cultural renaissance" by Art in the Adirondacks and as a festival that "has a limitless horizon" by the Glens Falls Chronicle, Kalia serves as Co-Founder and Music Director of the Lake George Music Festival, whose distinguished musicians come from many of North America's finest orchestras and conservatories. Last summer, the Glens Falls Chronicle hailed Kalia’s concert with the Festival Orchestra in Beethoven’s Seventh Symphony as the “concert of the summer.” The review goes on to say, "the entire orchestra, under Roger Kalia, were all fantastic, clearly caught up in the moment and launching it and us into a musical bliss...It's hard to imagine any orchestra anywhere playing Beethoven's Seventh Symphony better than they played it that night." Through its unique and innovative artistic collaborations and outreach, the festival was recently voted as the Best Annual Event by the City of Lake George, which has resulted in grants from the National Endowment of the Arts (NEA) and the NYS Council on the Arts. In 2016, Kalia created a groundbreaking series called Sounds of Our Time, which highlights the connections between the popular music of our time and orchestral music through an innovative concert format featuring visuals, audience engagement, and multimedia. The series has focused on a wide range of music by having the Festival Orchestra collaborate with EDM artists like MAKO and Balún as well as the genre-bending group PROJECT Trio. This series has gained national publicity by being featured in the League of American Orchestras The Hub, Broadway World, EDMjoy, the Albany Times Union and Saratoga Living. The Festival Orchestra has been broadcasted on a variety of national radio programs including National Public Radio’s (NPR) Performance Today with Fred Child, WQXR-NY, and Classic FM. 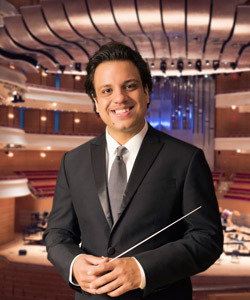 Kalia started his career as Music Director of the YMF Debut Orchestra of Los Angeles (2012-2015), following in the footsteps of such conductors as Michael Tilson Thomas and Andre Previn. Kalia led the orchestra in a variety of repertoire from Mozart through music by acclaimed video game and film composers. Highlights of his tenure included four world premieres, collaborations with violinist Glenn Dicterow and pianist Misha Dichter at UCLA’s Royce Hall, a production of Stravinsky’s L’Histoire du Soldat with actors Jack Black and Michael Lerner at the Los Angeles County Museum of Art, the Los Angeles premiere of Michael Giacchino’s Star Trek Into Darkness, a Gala concert featuring Randy Newman at the Annenberg Center for the Performing Arts, and a collaboration with the Angel City Chorale of Mendelssohn’s A Midsummer Night’s Dream in celebration of Shakespeare’s 450th anniversary. In addition, Kalia led the Debut Orchestra in the orchestra’s first-ever performance at the Our Lady of Angels Cathedral (the largest church in Los Angeles) in December 2012 for the Virgin of Guadalupe Festival with more than 2,000 people in attendance as well as being live-streamed worldwide. Kalia has held fellowships with the Chicago Sinfonietta as part of their Project Inclusion program, the American Academy of Conducting at the Aspen Music Festival with Robert Spano, the Conductors Guild Conductor/Composer Training Workshop at the Cabrillo Festival of Contemporary Music with Marin Alsop, the David Zinman International Conducting Masterclass with the Tonhalle Orchestra Zurich, and the Kurt Masur Conducting Seminar at the Manhattan School of Music. Passionate about teaching the next generation of musicians, Kalia maintains a regular teaching relationship with the Colburn School and Cal State Fullerton, and he recently conducted the Missouri All-State Symphony Orchestra. As an educator, Kalia has created family and educational concerts for orchestras across the country in a variety of concert formats including the use of multimedia, semi-staged operas, and collaborations with groups such as Cirque de la Symphonie, Orange County’s Festival Ballet Theater, speed painter Dan Dunn, the Magic Circle Mime Co., Really Inventive Stuff and TV personality Randy Jackson. A passionate advocate of modern music, Kalia has commissioned and programmed more than 100 works by some of America’s most innovative living composers including Mason Bates, Chris Rogerson, David Lang, Narong Prangcharoen, Harry Stafylakis, and Paul Chihara, among others. This past year, Kalia commissioned works by Sheridan Seyfried, Paul Dooley, and Brendan Faegre to rave reviews, and conducted the Orange County premiere of Austin Wintory’s Journey Suite with Pacific Symphony Youth Orchestra, the first-ever video game score to be nominated for a Grammy. Kalia holds degrees from Indiana University, the University of Houston and SUNY Potsdam's Crane School of Music. At Indiana University, Kalia served as an Associate Instructor and Assistant Conductor of the IU Opera Theater and New Music Ensemble. His primary mentors include David Effron, Arthur Fagen, and Franz Anton Krager. Born and raised in New York, Kalia resides in Southern California with his wife, musicologist/violinist Christine Wisch, and their dog Burney.